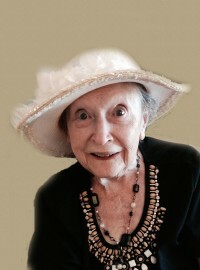 Jessie V. Beers, age 91, of Kittanning, PA, died Thursday, January 31, 2019, at the Fair Winds Manor, Sarver, PA.
She was born March 2, 1927 in N. Buffalo Twp., PA, the daughter of Ralph and Eva Agnes (Simmers) McClanahan. Jessie was a lifetime resident of the Kittanning area. Faith, family and friends were a large part of her life. She was a homemaker who loved caring for her family and enjoyed the time she spent with her grandchildren and great-grandchildren. She enjoyed gardening and was a wonderful cook and baker. She found pleasure in singing and playing her electric guitar. Jessie's family is thankful for the exceptional care that was provided by Fair Winds Manor as well as Three Rivers Hospice. She leaves behind to cherish her memory her husband, Alfred C. Beers, whom she married November 3, 1948 and shared 70 beautiful years of marriage; daughter, Jean V. Huntley, of Kittanning; two grandchildren, Amy Huntley and Chad Huntley and wife, Susan; great-grandchildren, Kaylee Huntley, Amber Bowser and Shanelle Bowser. In addition, two close family friends Randy Wain and Crystal Slone. Jessie was preceded in death by her parents; brothers, K. Carl, George W. "Pete", Robert E. "Eight", and Dale E. "Six" McClanahan; and sisters, Hazel I. McKelvey and Zelma M. Lucovich; and a son-in-law, Donald W. Huntley, Jr.
Family and friends will be received from 2PM until the time of funeral services at 5PM on Wednesday, February 6, 2019 at Bauer Funeral Home and Cremation Services, Inc., 515 N. McKean Street, Kittanning, with Rev. Mark Brady officiating. Private burial will be in Lawn Haven Burial Estates, Worthington, Pennsylvania. Memorial contributions may be made in Jessie's honor to Three Rivers Hospice, 2500 Mosside Blvd., Monroeville, PA 15146, or the First Baptist Church, 334 Arch St., Kittanning, PA 16201.